Movienizer helps you organize your collection of movies. You can easily add your DVD's, Blu-ray's, video files, scan barcodes, or simply add any movies by title. On the other hand, Movienizer allows you to explore the world of movies. You can click on an actor and download his / her biography, photos, filmography. After this, you may click a movie in the newly loaded filmography and download information about the movie. Now, what if you find the details interesting and want to have such movie in your collection? Let's set the "Wanted" flag. We can click them to set or clear the corresponding status. 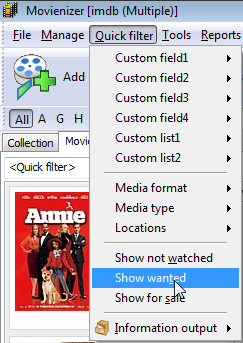 By default, the Breeze interface of Movienizer hides the "Wanted" and "For sale" icons (they are displayed only if the corresponding status is set), but you can change this behavior in the interface settings window. When you get a wanted movie, just set the "In collection" flag for it. Movienizer will automatically clear the "Wanted" flag (but you will be able to set it again, if necessary). 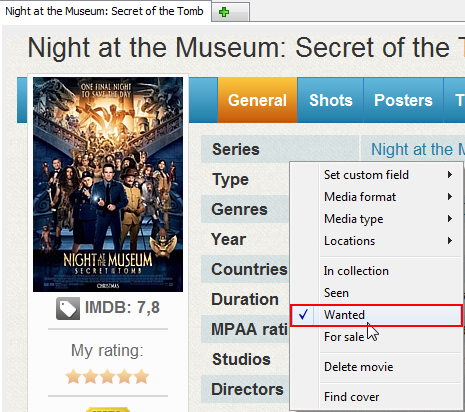 The "Wanted" status can also be used on the "Search" tab, on the "Collection" tab, in Extended filters, etc.